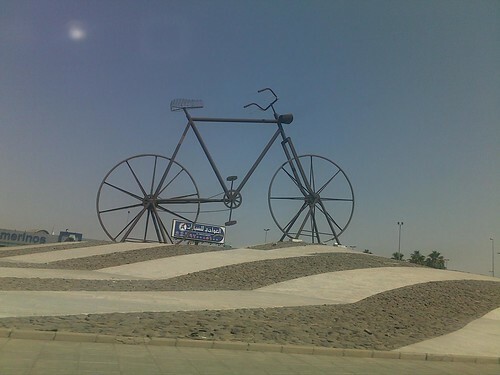 World's largest bicycle is a huge sculpture in a roundabout in Jeddah. The 15 metres high bicycle is an art work of Spanish artist Julio Lafuente who created it in early eighties from scrap metal. 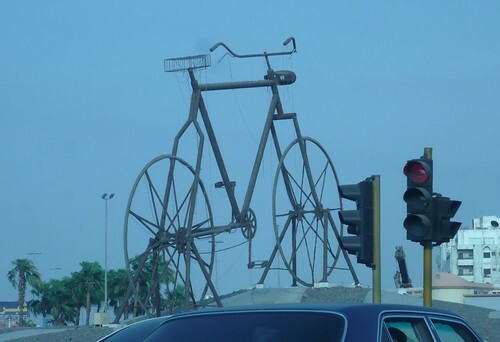 Incidentally most of the roundabouts/public squares in Jeddah have some sort of sculpture and are commonly known by the sculpture installed there. This one is known as 'The Cycle Roundabout'. Perhaps it is the best way in a multi-language, international port city to identify the localities. Many more sculptures of Jeddah can be seen in blog entitled Jeddah Daily Photo Journal. Susieofarabia, through her comments has kindly furnished following additional information about the giant bike. The length of the bicycle from one end to the other is 25 meters. There is also a spare wheel sculpture that accompanies it about 90 meters away on the same enormous roundabout. Image from Picasaweb is by & courtesy Sajith K.A who has sent me the link to this image of spare tyre sculpture. Another interesting tidbit is that the scrap metal from which these sculptures were created came from a derelict old marble factory that was established by Mohammed Bin Laden. Thank you susieofarabia and Sajith K.A. Just a little more information for you about The Bicycle - its height is 15 meters and from one end to the other it is 25 meters. There is also a spare wheel sculpture that accompanies it which is 90 meters away on the same enormous roundabout. Another interesting tidbit is that the scrap metal from which these sculptures were created came from a derelict old marble factory that was established by Mohammed Bin Laden. Thanks for the plug - Nice blog you have here! Thank you for selecting my photo for this journal. also u can see spare wheel sculpture below link.